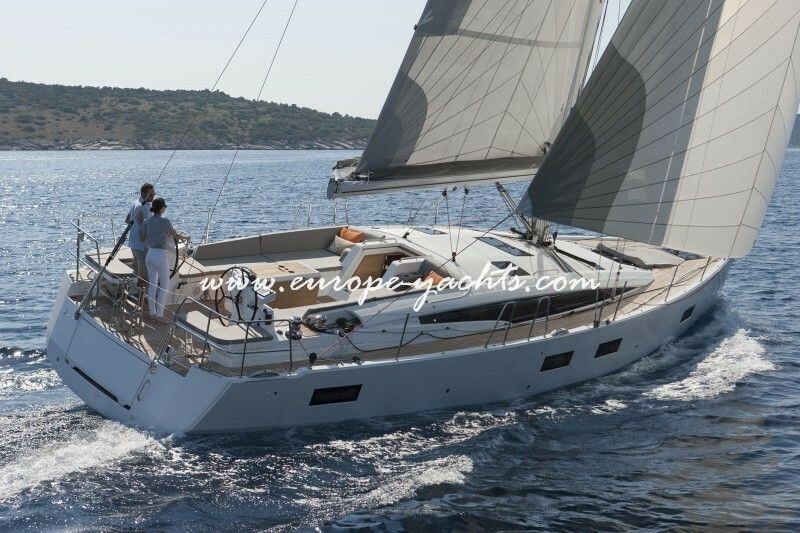 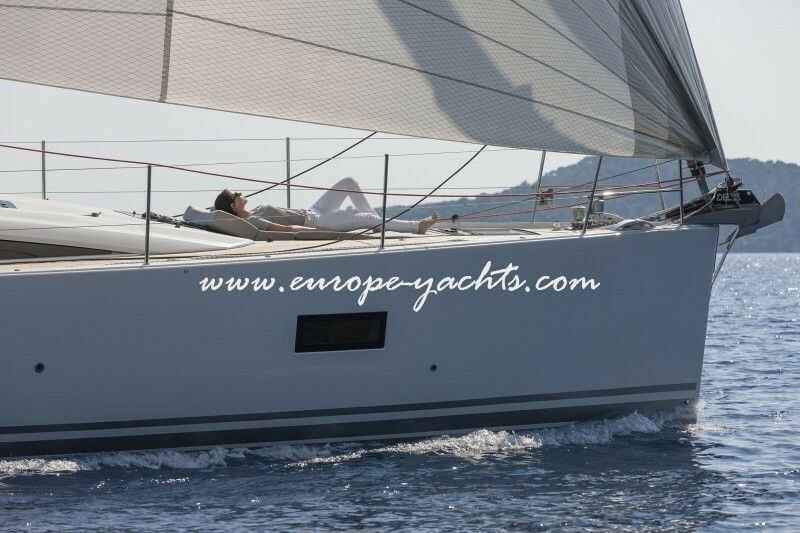 Europe Yachts proudly presents a brand new add to our bareboat sailing fleet in Greece – the all new Jeanneau 54. 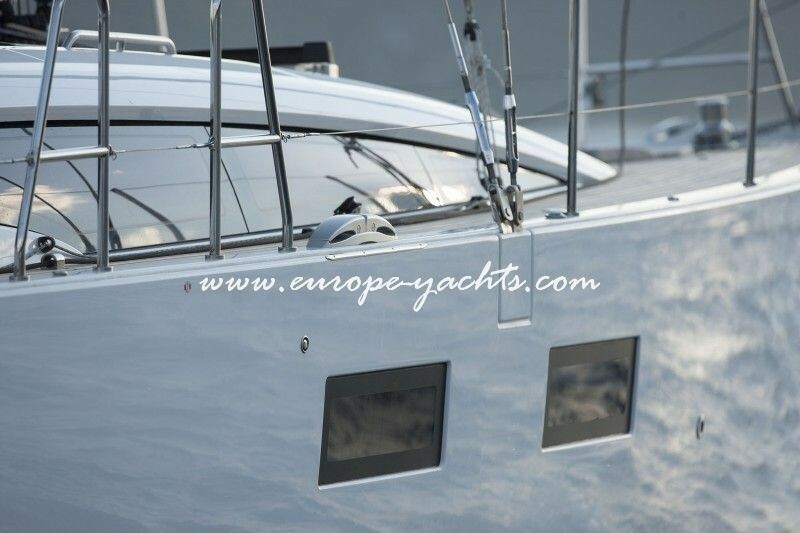 What is it sailors can expect from the new 54 Jeanneau class yacht? 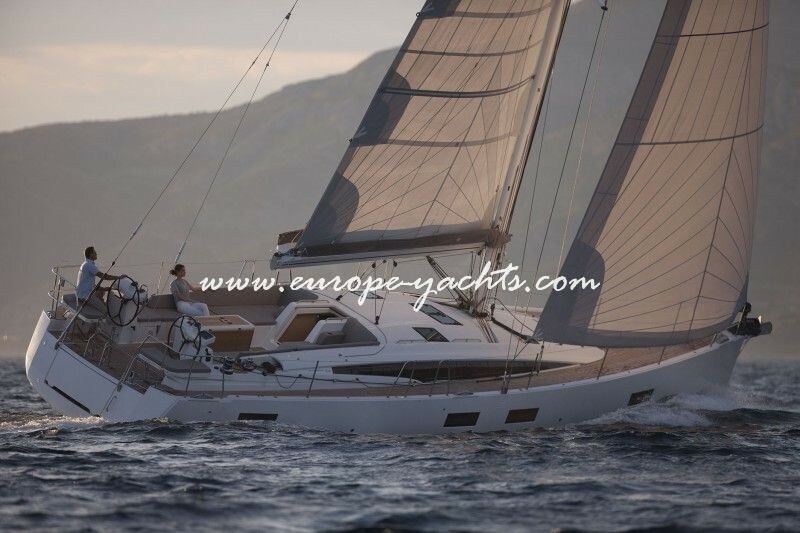 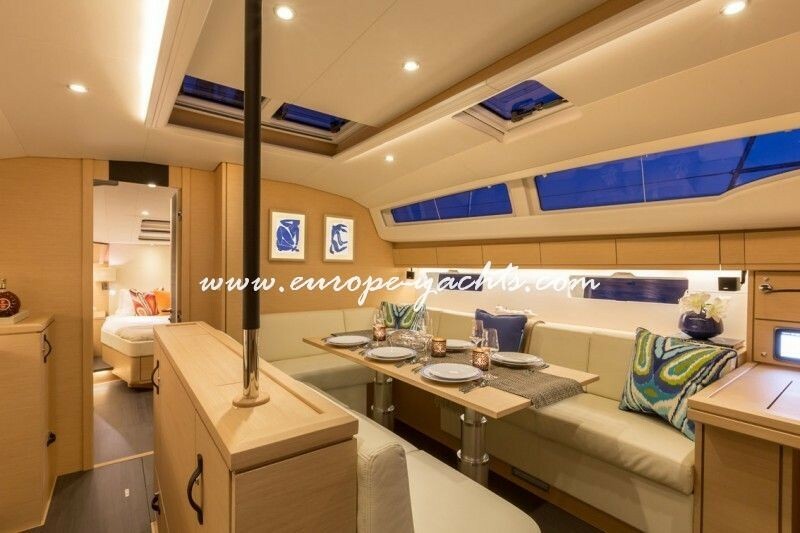 -Having a look on the renowned designers who created this awe-inspiring sailing boat and it will be clear that the Jeanneau 54 for rent is set to be a winning formula. 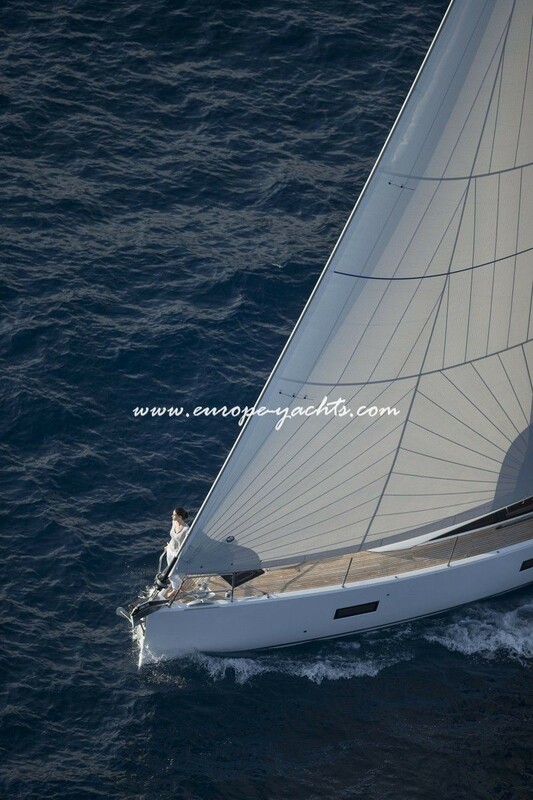 Designed on the drawing boards of Philippe Briand for exteriors and Andrew Winch for the interior, this new Jeanneau masterpiece promises to be one of the most compelling sailing yachts on the market in the below 55 feet class. 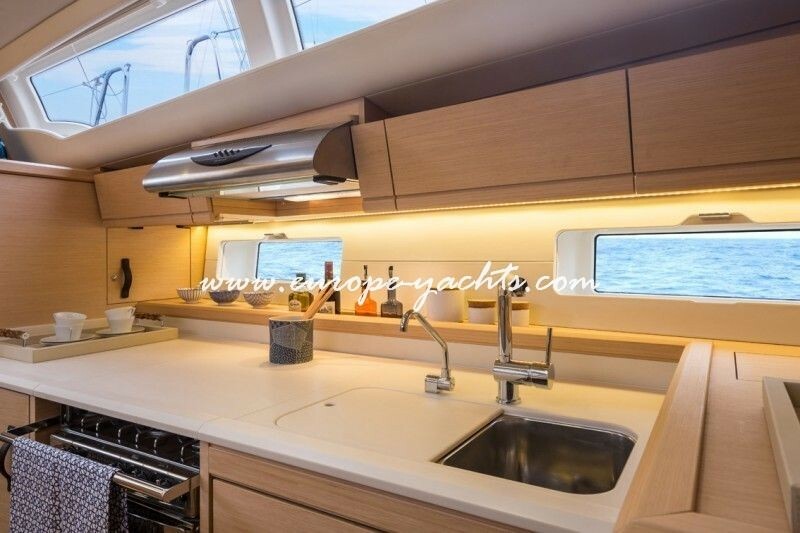 Charter yacht Jeanneau 54 is an all new design putting pleasure to the fore, displaying an exemplary use of space with her charter-friendly layout that is thoughtful in its design combining all DNA the French builders are known for. 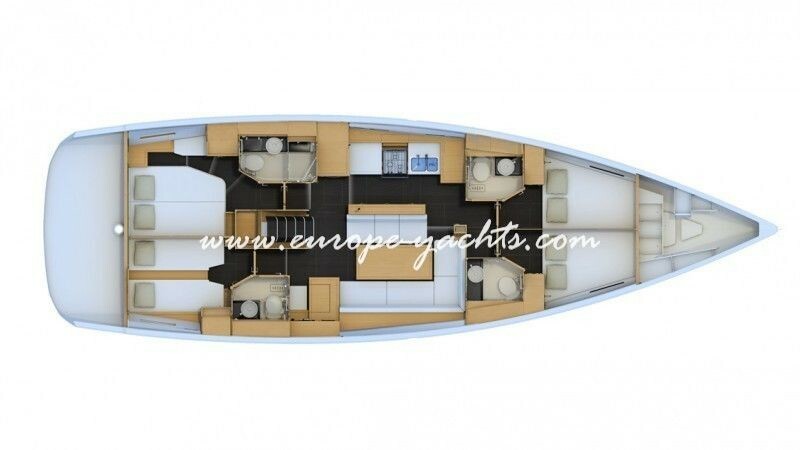 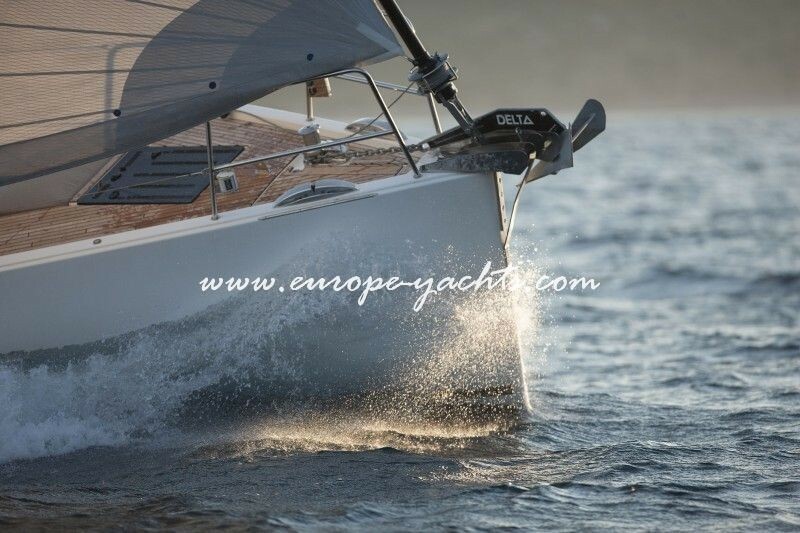 Characterized by responsivity, agility, comfort, speed under power and sails, exceptional seaworthiness, control and performance with lots of special equipment this yacht is the ideal holiday boat for families and couples. 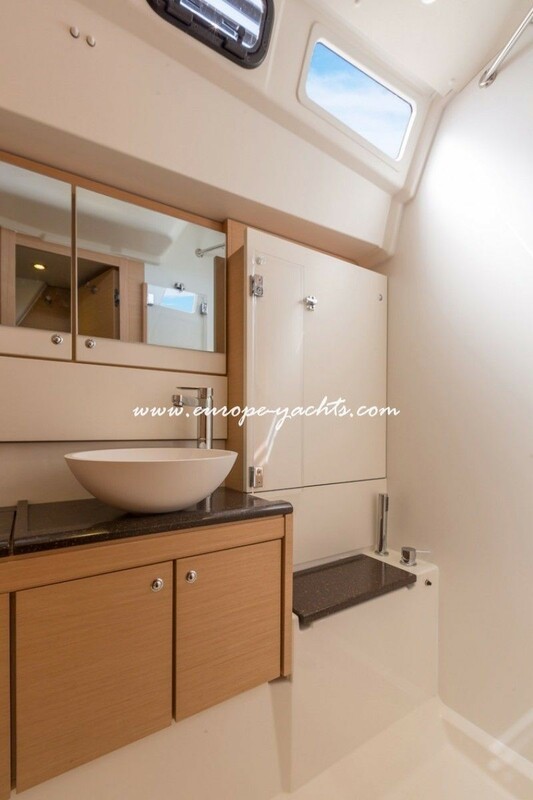 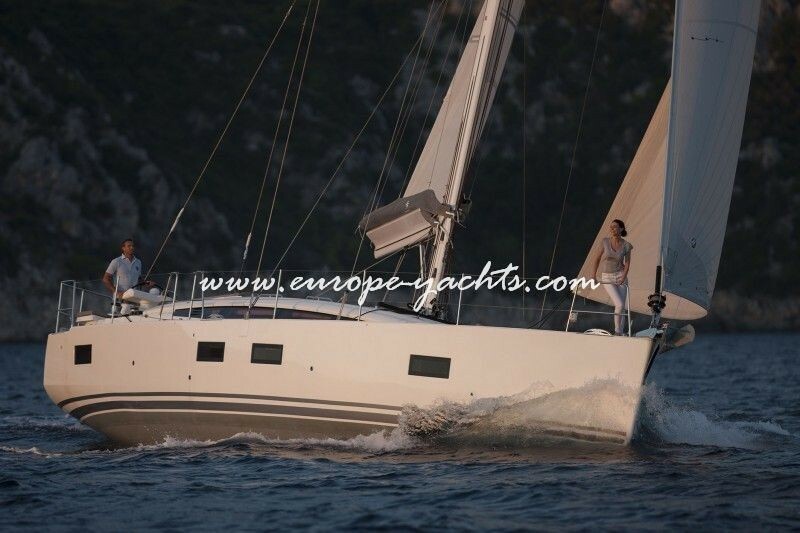 Our Jeanneau 54 for hire in Greece comes in the 5+1 cabin layout, with 3 double cabins, 1 twin, 1 bunk bed and a completely separated skipper’s cabin forward with own deck entrance for utmost privacy and discretion once booked with professional crew. 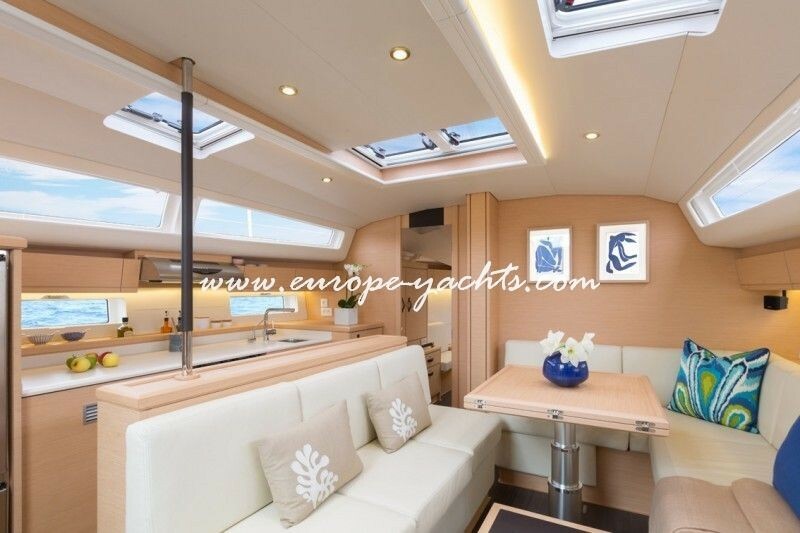 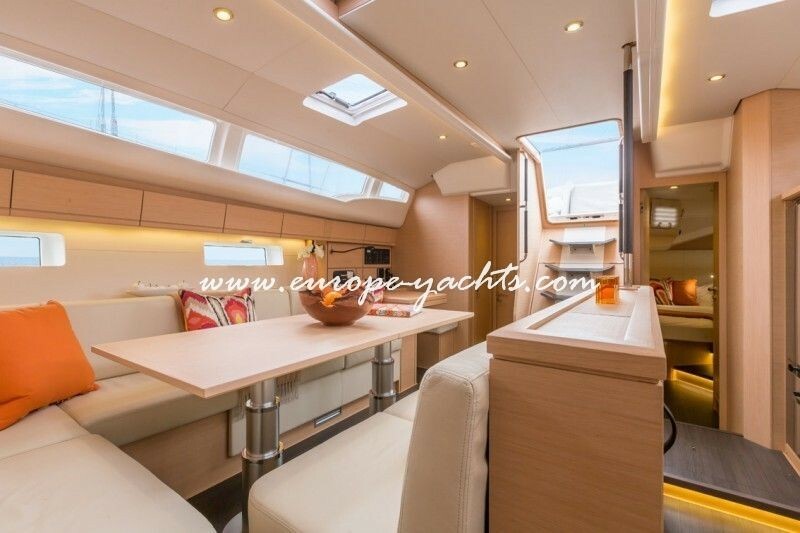 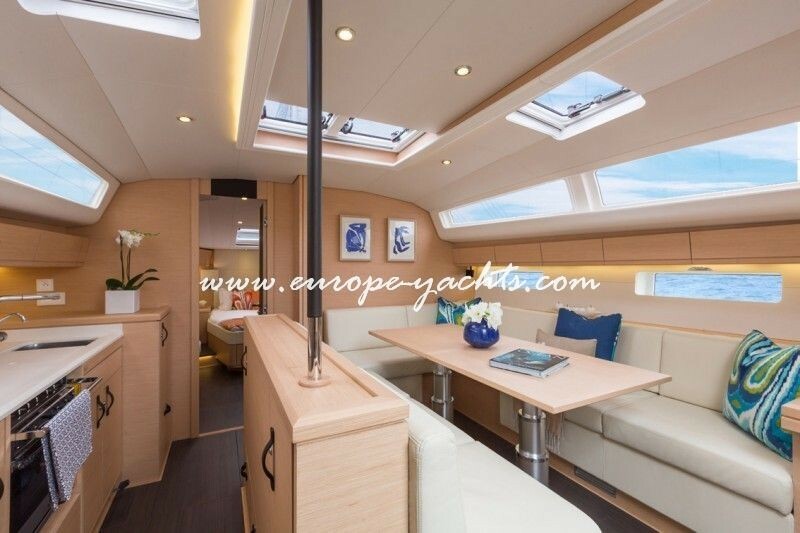 The signature of Philippe Briand has a very strong impact on the generous cockpit with ample living space designed to be the perfect open-air social area for relaxing or alfresco dining. 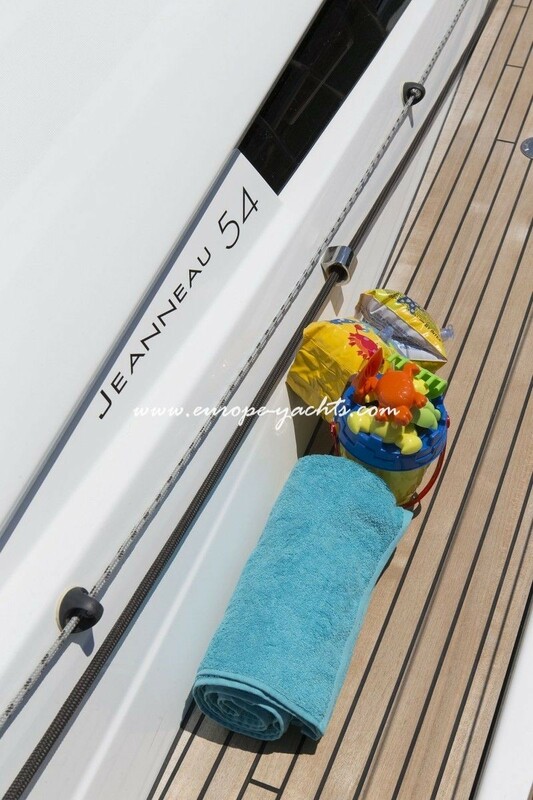 The dinghy, part of the standard charter equipment, has a very practical storage management and our new 54 footer does not miss to have a comfortable bathing platform aft. 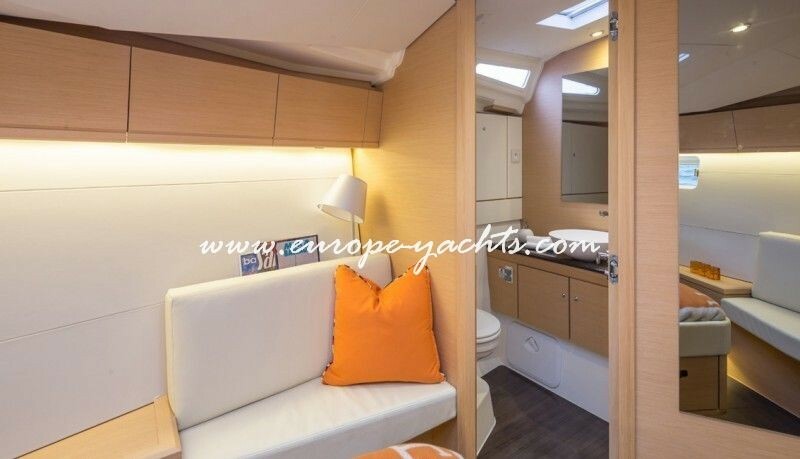 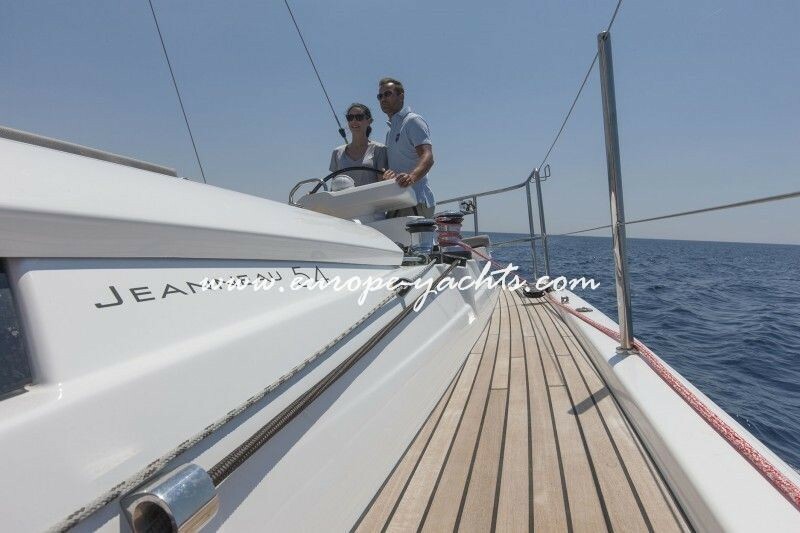 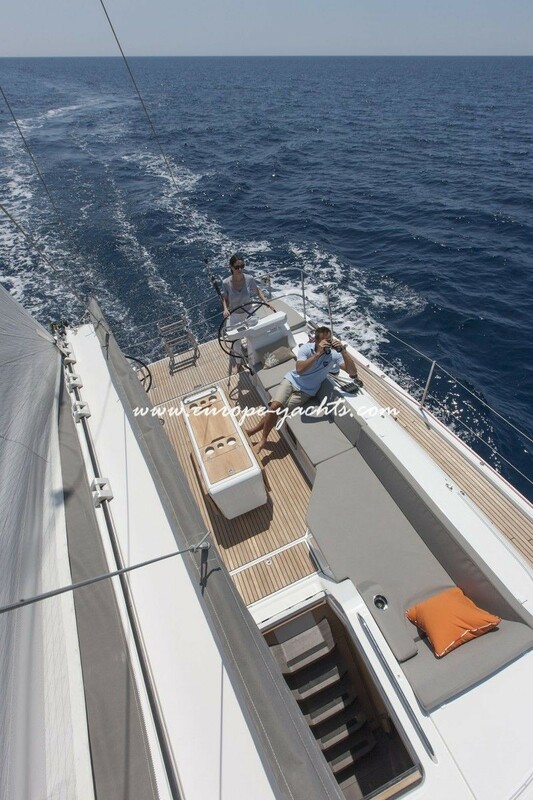 Our new Jeanneau for rent in Greece is equipped with air condition, generator, bow thruster, electric winches, solar panlels, LED-TV set with DVD-player, inverter, hydraulic gangway and many more special equipment to ensure comfort on board. 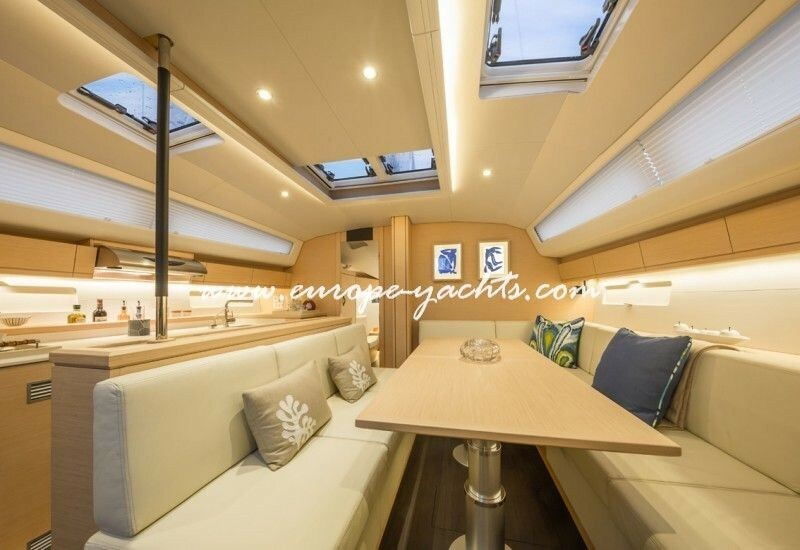 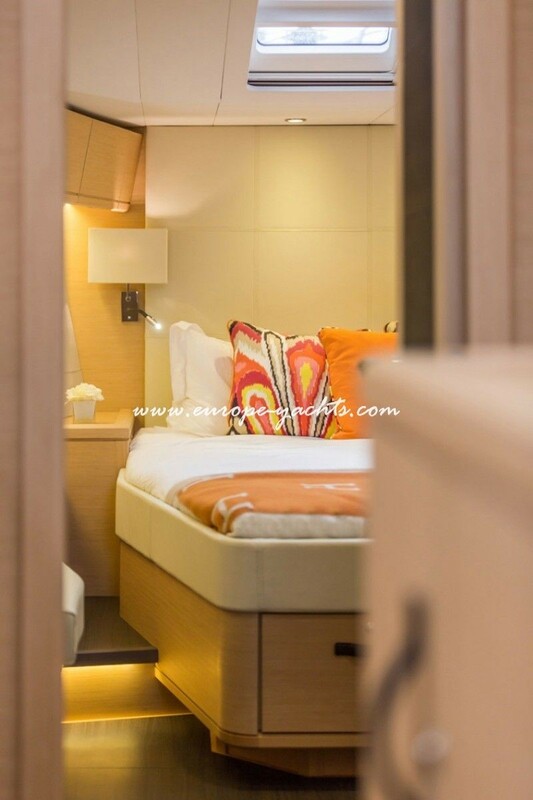 Below deck Andrew Winch has designed an interior which invites you to indulge in modern and warm surroundings. 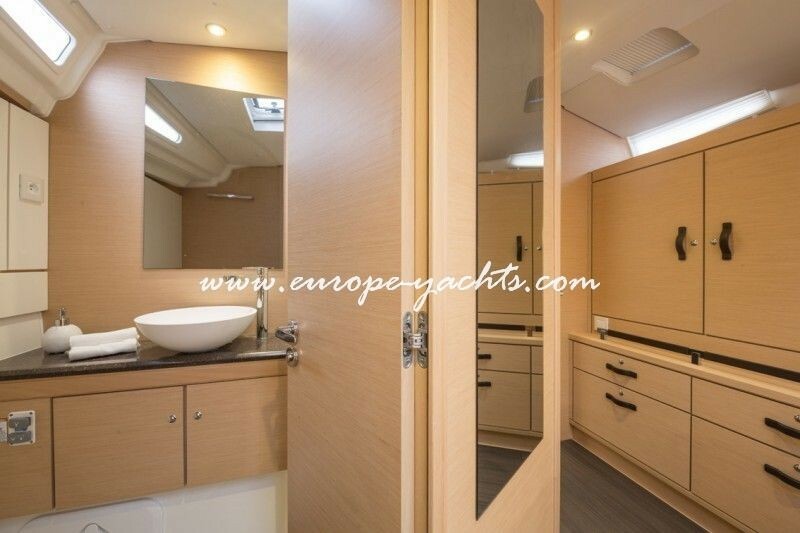 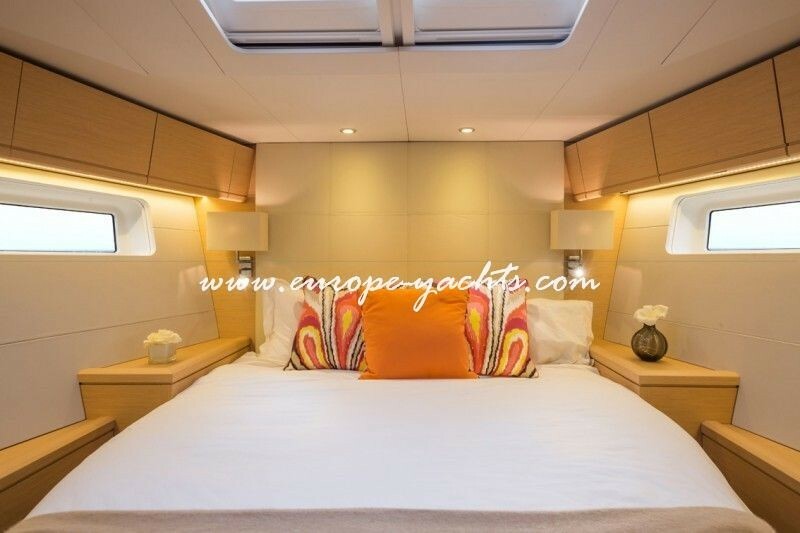 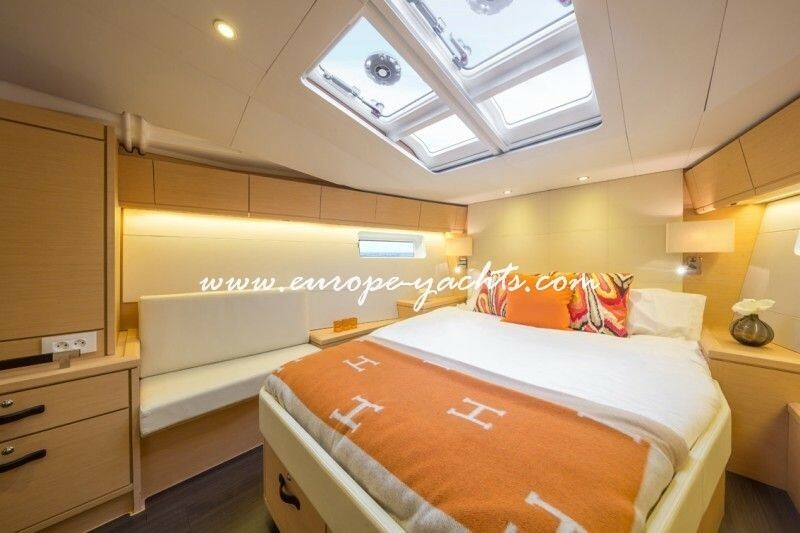 The well-appointed saloon and perfectly equipped galley are practical with a strong focus on ergonomics and high quality finishes which are also known from her bigger sisters, the Jeanneau 57 and the new Jeanneau 64 available for rent through Europe Yachts as well. 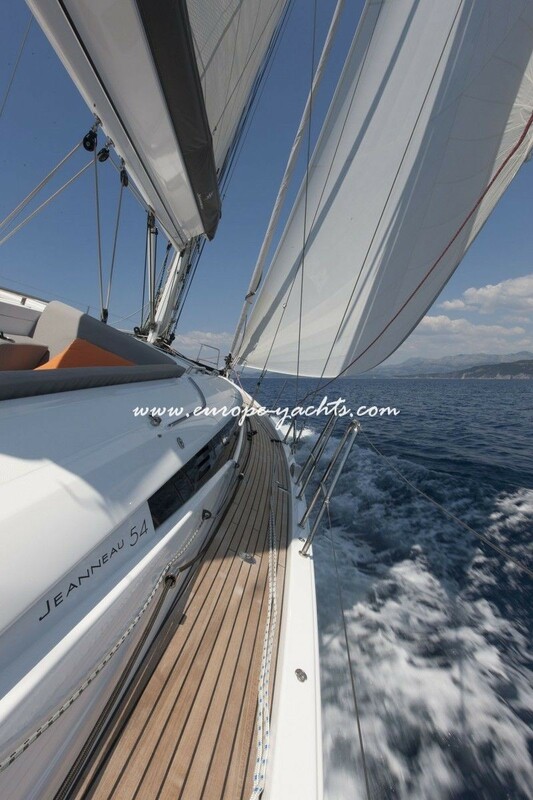 Add that special touch of luxury to your sailing holidays and seriously consider the new Jeanneau 54 for your cruise in sunny Greece. 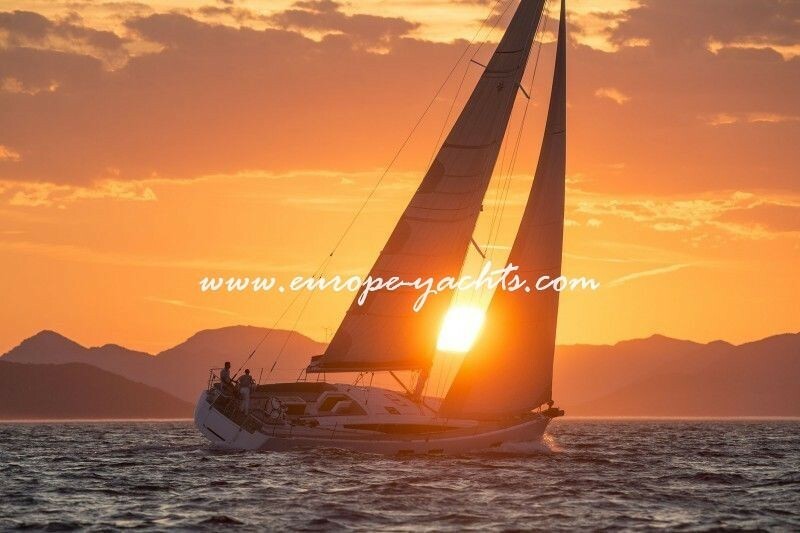 Based in the Cyclades she can be hired on bareboat basis or with crew, for round trips or one way to many famous Greek islands upon availability. 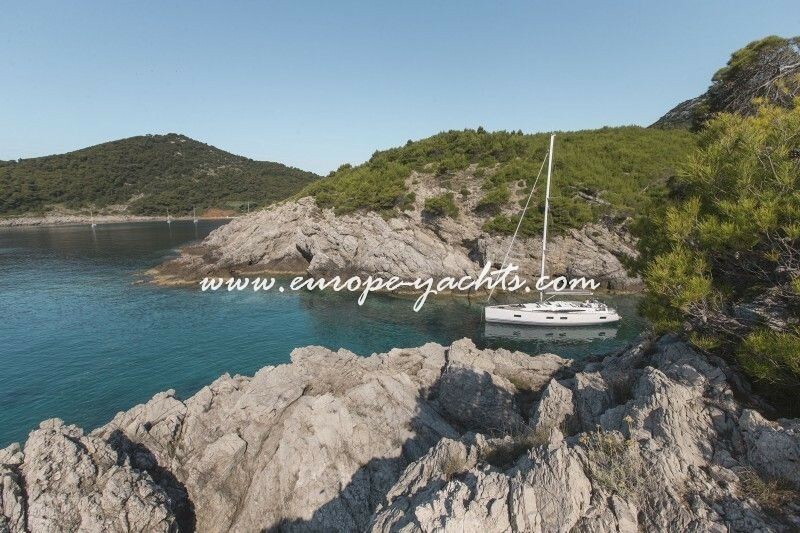 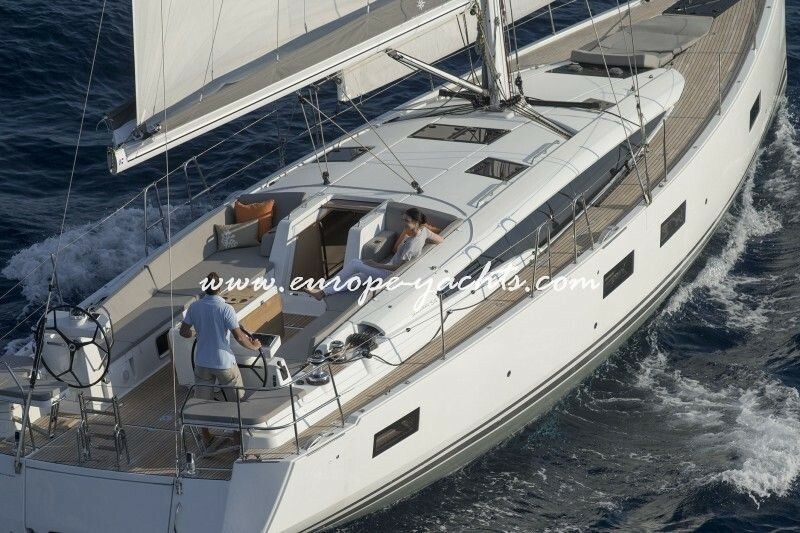 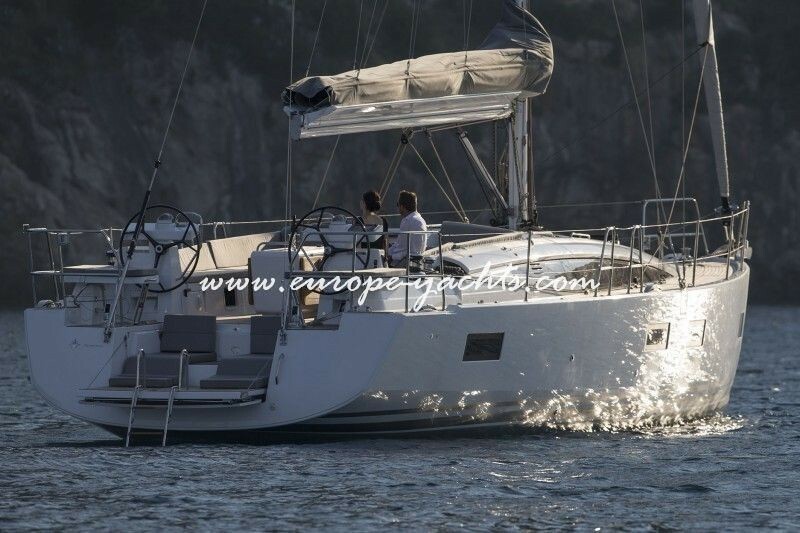 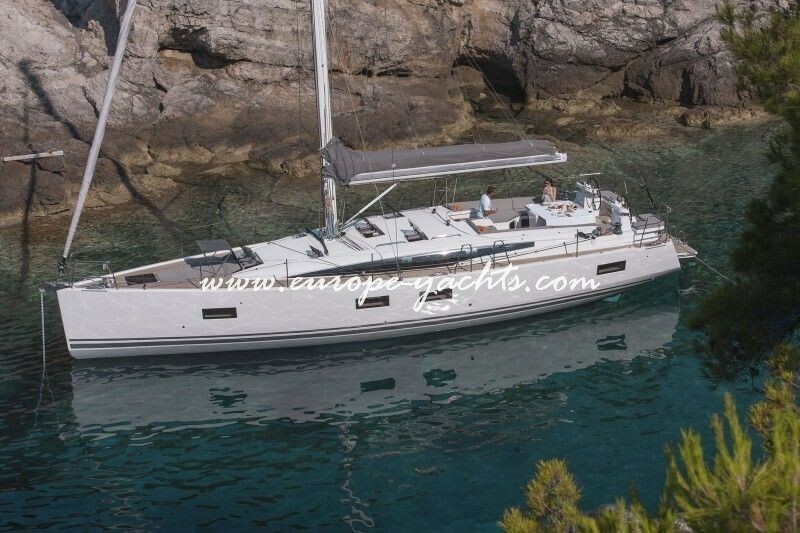 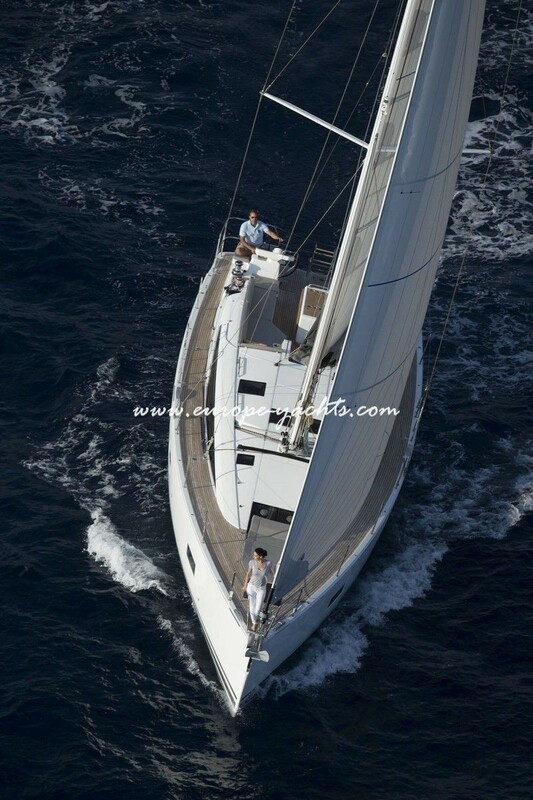 Sailboat Jeanneau 54 for hire in Greece is based in Athens but available for one way charters to various charter bases in the Cyclades, Ionians, Saronic and Dodecanese islands. 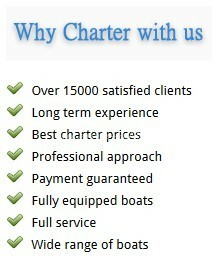 Subject to availability one way charter fees may apply. 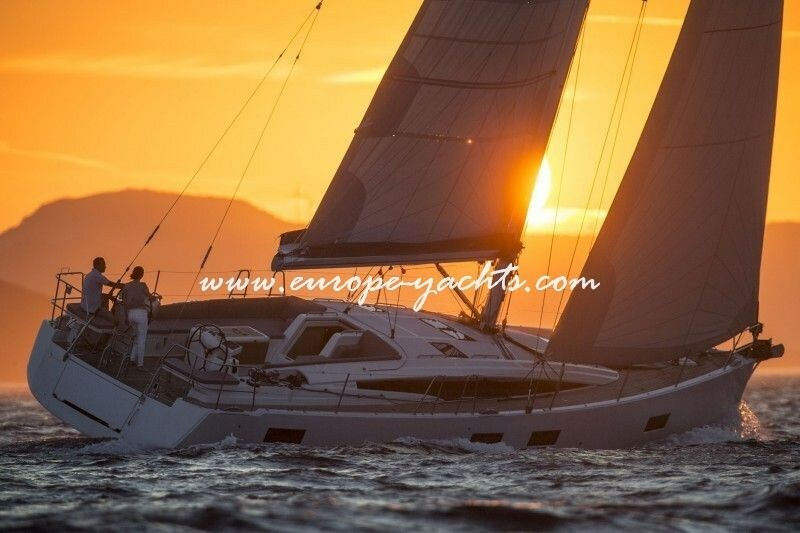 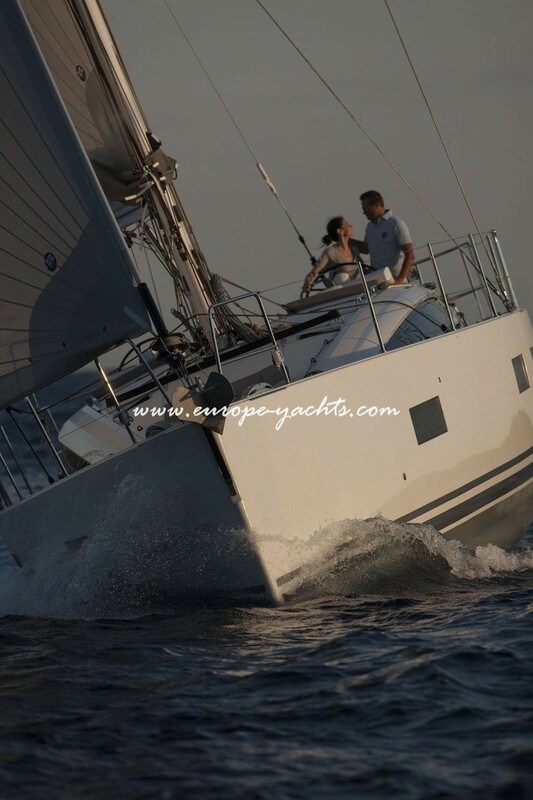 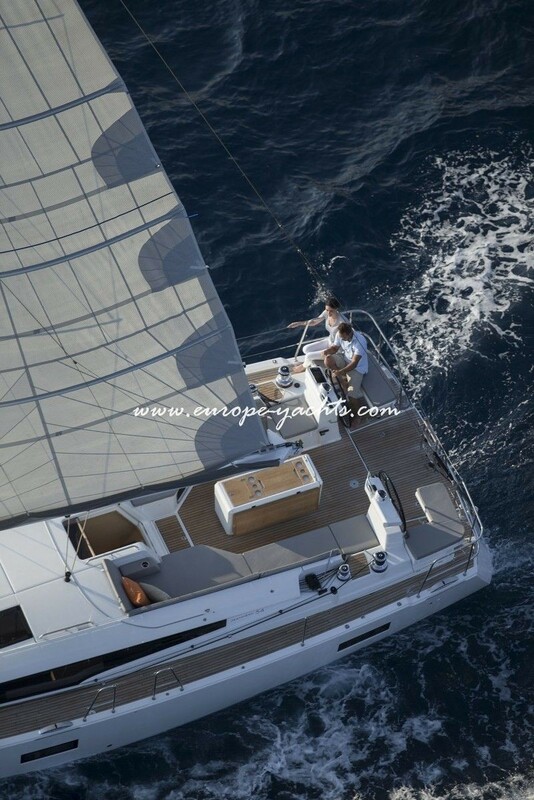 Please contact Greece Charter for more details on one way sailing rental in Greece and book Jeanneau 54 sailing yacht on bareboat or crewed basis with our professional skipper. 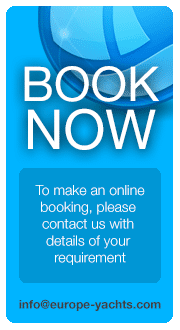 Gas stove & oven , Cuttlery – Kitchen equipment , Pans, plates, glasses, spoons, knifes, etc.